New Delhi, Dec 2: India opener Murali Vijay celebrated like Atletico Madrid star forward Antonie Griezmann after notching his 11th Test century at the Ferozeshah Kotla Stadium here on Saturday in the third Test against Sri Lanka. The Tamil Nadu batsman waved his bat to the stadium and later performed the iconic Griezmann move to celebrate his century. 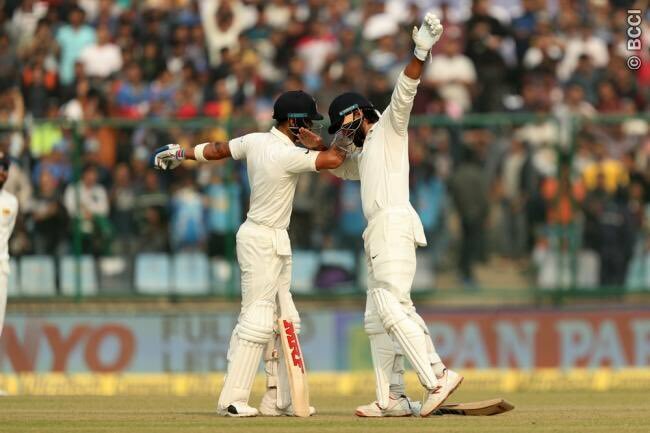 Later, India skipper Virat Kohli, who brought up his 20th century was seen performing a dab along with Vijay which was noted by the International Cricket Council (ICC). "Celebrating a century in style, courtesy of @mvj888 and @imVkohli! #INDvSL." ICC tweeted.